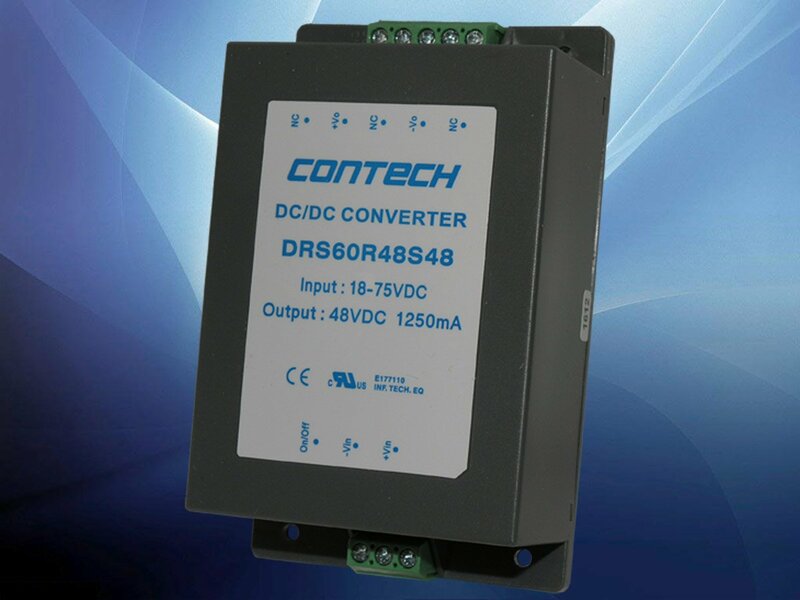 ConTech, a Division of Calex Mfg., announces the DRS series of chassis mount DC/DC converters. The DRS Series offers 60 Watts of output power in an encapsulated case, making it well suited for ruggedized backplane applications. The optional Din-Rail mount and easily accessible terminal blocks gives it the versatility to be used as a power solution in a large assortment of applications. The DRS series offers output voltages from 5.1 VDC to 48VDC, with input ranges of 9-36 and 18-75 VDC, while achieving efficiencies up to 92%. The series has output over-voltage and short circuit protection. The units are encapsulated with a thermally conductive potting compound in a plastic resin and fiberglass case that meets UL94V-0. The enclosed case has external terminal blocks for ease of connection and is chassis mountable. Adding optional accessory DIN-03 base plate easily converts the chassis mount case to a standard Din-Rail mount. The DRS series is rated for 2500 VDC isolation, is UL approved, and is RoHS compliant.